I first became a fan of Just Tomatoes a long time ago when my mom would buy the freeze dried cherries for a treat for my siblings and I. Recently, I contacted the company to try some more of their products. They sell all different kinds of natural dried fruits and vegetables. 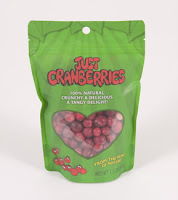 For my review, I was sent some dried cranberries, just raspberries powder, just veggies, and just fruit munchies. Since dried fruit is one of my favorite foods, I dug right in when I received the package. My favorite of all of the products that I tried are the dried cranberries and the dried cherries from the just fruit munchies package. The fruit is all very crunchy and a lot of it will melt in your mouth. The cranberries are very tart which I like. They are not at all comparable to typical sweetened dried cranberries but have the true tart cranberry flavor. The cherries are great too. They are a bit tart and chewy. The raspberry powder that I received will be awesome stirred into my oatmeal. The only thing I don't really like are the dried grapes because they are a bit overly sweet and too crunchy for my liking. I really enjoyed trying the different kinds of dried fruits that I had not tried before. Just Tomatoes products make a very fun snack for both adults and kids. If you have not tried any yet, I would definitely recommend it. Hi, new follower via Tough Cookie Mommy (Blog hops).